I’m here today to review one of Clairefontaine’s GraF it dot grid pads. Exaclair, Inc has kindly agreed to give away four of these pads, so be sure to check the giveaway information at the end of this post (Giveaway is over). When you see the GraF it, your first thought might be, “Hmmm. Another sketchpad.” The pale color and unassuming drawing on the cover aren’t flashy. But then you notice those huge staples. 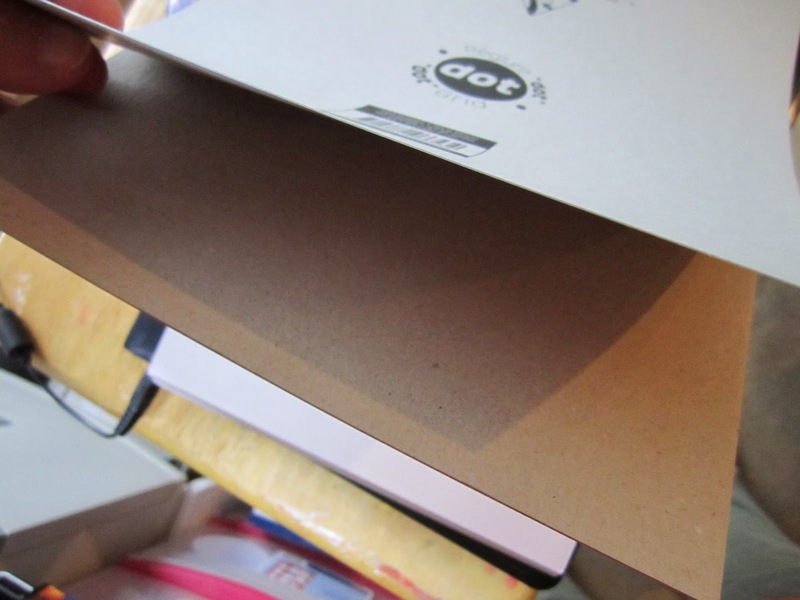 And, although the cover front and back is a light, but stiff cardboard, you realize there is also a heavier cardboard, to provide a sturdy backing. There are three creases in the front cover, so it will easily fold to the back. The paper is micro-perfed for easy removal, but there’s a lot of ‘stub’, the paper left behind, to hold the sheets in the pad until you ‘want’ to remove them. If you are like me, the word ‘workhorse’ comes to mind. You know, that tablet that lies around, stacked on top of things, or under things, is carried from room to room, gets shoved into drawers and pulled out for any and every purpose when paper is needed. The paper looked as though it would be soft. It is not. It has a hard surface for non-cardstock, but it is not stiff. It is smooth but not slick. It folds and takes creases well. When you hold the paper to the light you can see the threads running through it, so there is a degree of translucence. It doesn’t have much tooth that you can feel when you run your fingers across the page, but when you paint on it, you discover there is a grain. More on that later. What I’ve just written applies to the GraF it sketchpad of all sizes and formats. Formerly, the GraF it was only available in a blank page format. As you have probably guessed from the title of this review, it now comes in a dot grid format as well. The dots are a very light violet/gray color. Perfect for those who want just the hint of a guide. A little less perfect for those with weaker eyesight, or who want a darker guide. 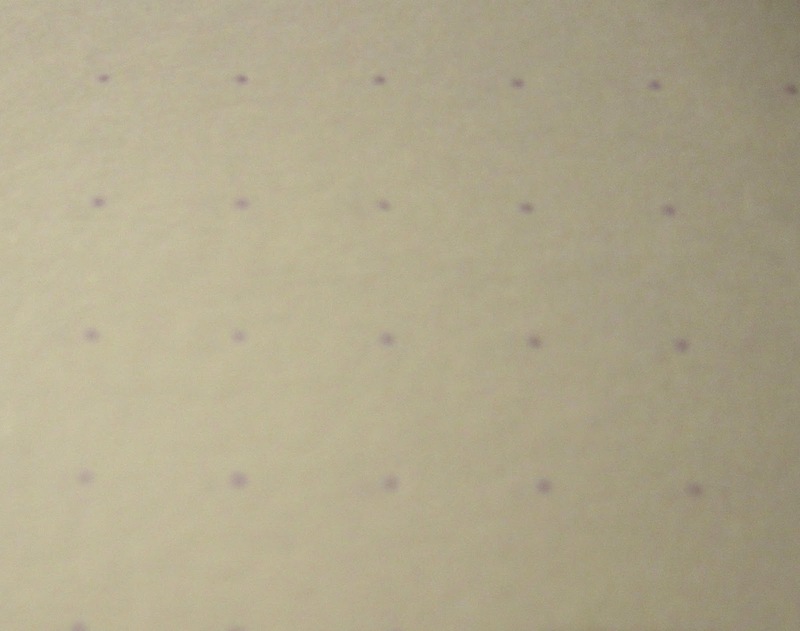 As with most dot grids, the dots tend to fade from notice, once you’ve written or otherwise used the paper. I love them for anything but the most formal of artworks. The paper is definitely fountain pen friendly. When I wrote, using several inks and pens, there was no feathering, skipping or bleed-through to the back. Drying time is fairly long and some inks may look a bit different on this paper than on others. The difference isn’t so much a matter of the color shade, but in the intensity. Some colors are more muted, though I noticed this more with other media then I did with fountain pen ink. 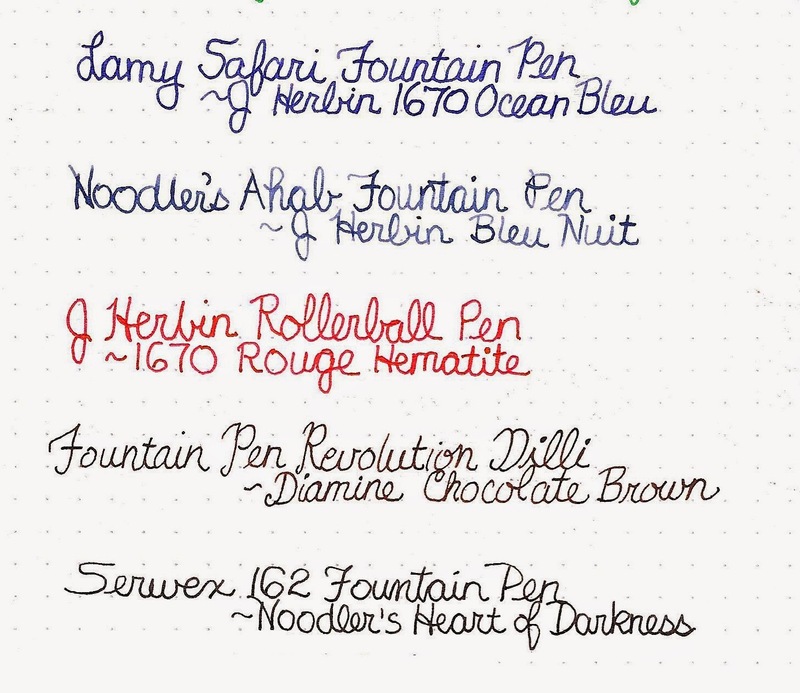 When I used fountain pens to draw, I did get some tiny dots of color, where I added wet ink over wet ink. Getting a full saturation of color was a bit more difficult than I expected, though that may partly have been the weather. I’ve noticed the same thing on papers that I’ve used in the past without problem. The difference in color was very marked with my Copics. Usually, the colors would have been brilliant and smooth and translucent. On this paper, they were paler, more muted and almost seemed to granulate. 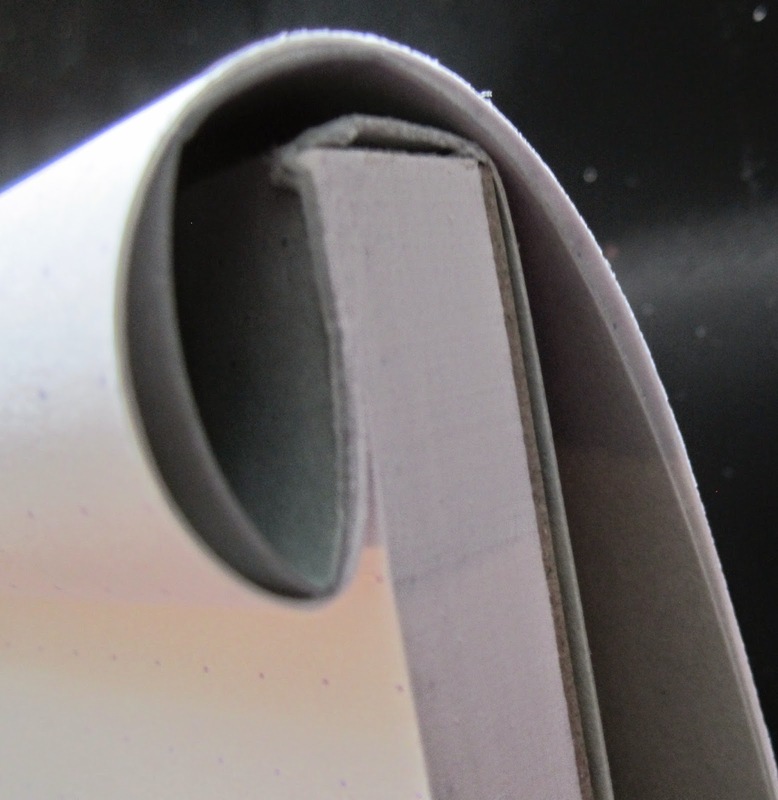 Here you can see a close-up of the paper grain that shows through. I don’t find this a bad thing. I like the texture, and muted colors are great for certain kinds of work. But I would definitely plan a different kind of art when using the GraF it and alcohol markers. Alcohol marker always bleeds through to the back unless a paper is very heavy or specially coated. I like to color one side, and then use the same color base to draw something different on both sides (I call this a bleedthrumanade). This is the front and the back of the sheet before I added line work. The bleed through wasn’t too bad for the weight of the paper. To get darker values with alcohol marker, you lay down one coat of color, then color over it in layers until you get the darkness you wanted. The first layers bled through, but subsequent layers did not, for the most part. I then used a Pentel pigment ink brush pen to add my line work. The brush pen really likes this paper, lol! I ended up going a little darker than I meant to, because it was so much fun playing with the pen. 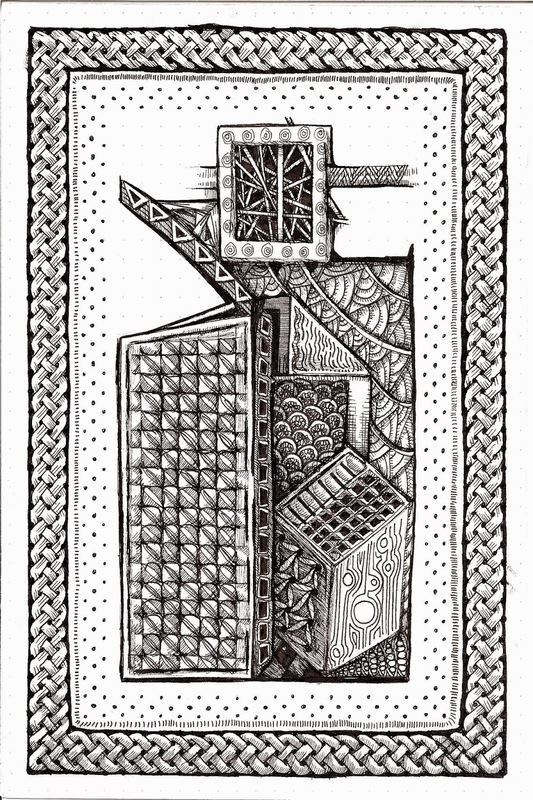 A good deal of my work, especially my Zentangle®-Inspired Art, is done with Pigma Micron pens of varying sizes. The dot grid is excellent for this, because you can use the dots to help you with a pattern, or just ignore them if they aren’t needed. 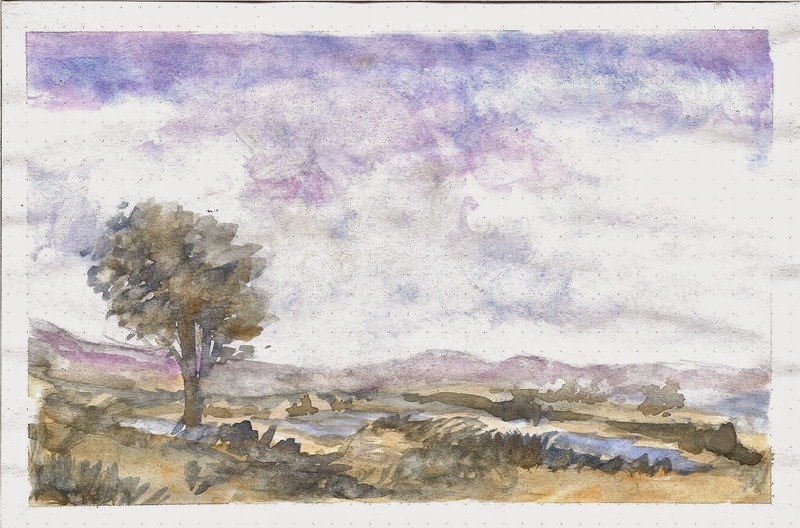 I always like to try watercolor or some very ‘wet’ medium on paper because it tells me how sturdy it is. The 41 lb paper in this pad is thicker and stiffer than the weight might indicate, but it’s still a thin paper. So, I wasn’t surprised when I got some buckling and curling. Much of it disappeared on its own once the paint dried. I weighted it down after, and only a few dimples remained. I worked fairly wet on that sky, wetting the paper first, and dropping wet paint into wet. I used a paper towel to lift some paint for the clouds, scrubbing harder than I normally would, but never got any pilling. There was a slight texture change, but didn’t seem any different as they had with the alcohol markers. Watercolor isn’t recommended because of the buckling and curling, which makes the painting itself more difficult to do. But the result is fine for quick studies, so you might want to use for them on occasion. The last thing I tried was a mixed media experiment. I painted the background with acrylic paint. Then I cut one of my quick study watercolor paintings into two pieces and glued it down with gel medium. I applied three kinds of self-adhesive drywall tape and painted them with more acrylic paint. The black comes from bits of string paper that I tore up and glued down. Lastly, I melted sealing wax and dripped on the copper bits. 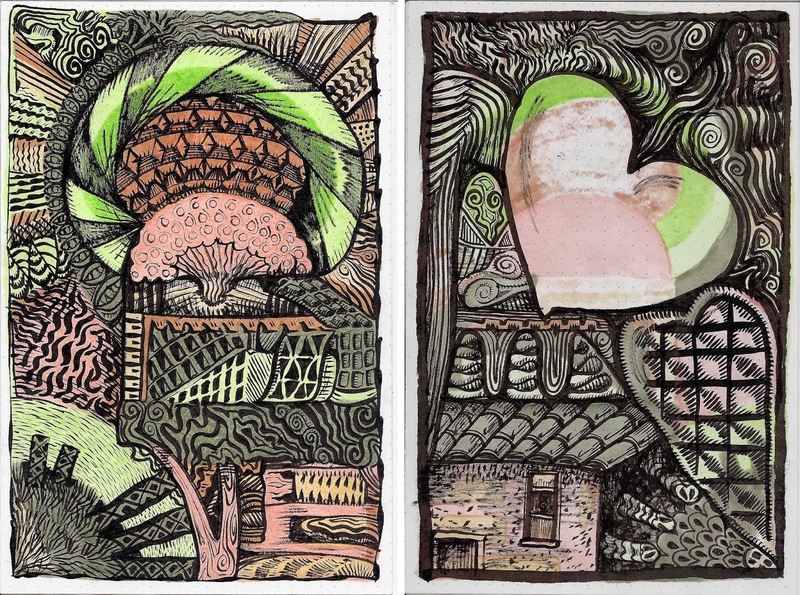 The method to my madness was to collage varying weights of paper and other mediums. 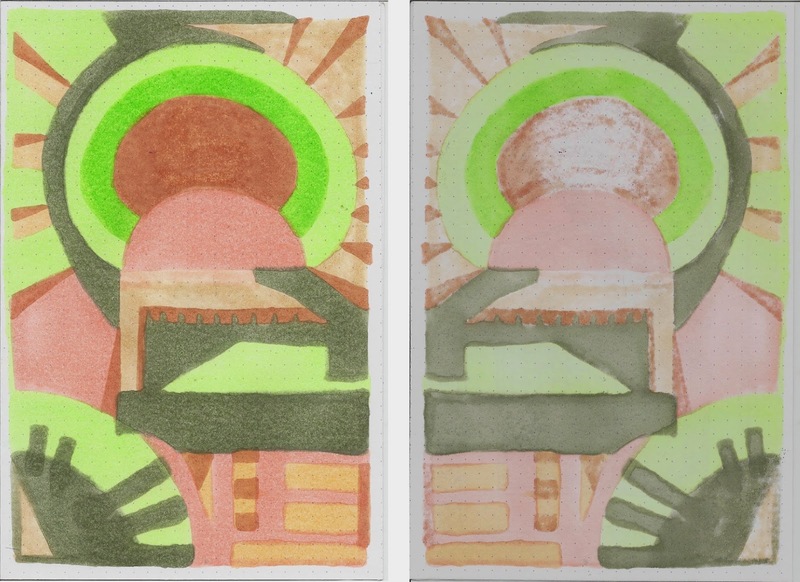 The watercolor paper was 140 lbs–much heavier, stiffer and thicker than the GraF it paper. Overall, the paper performed well. You can see some wrinkling on the back where the edges of the watercolor paper is. I couldn’t find my brayer, and I might have been able to push some of those wrinkles out if I had used it. All in all, though, I consider this piece a success. 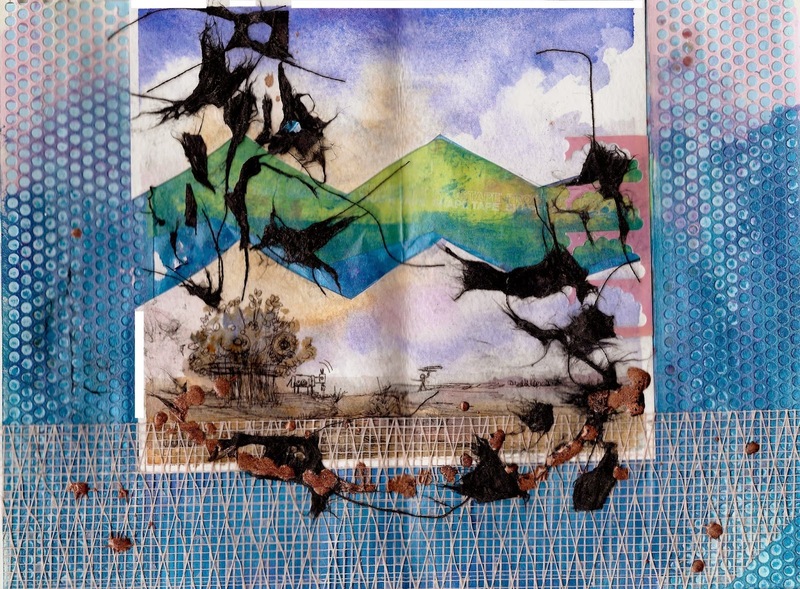 I’d have no qualms about using the paper for an art journal. I would just avoid adding heavy items, or use the wrinkles for texture when working on the back. My first impression of the GraF it was of sturdiness, and after working with it for a while, I still have that impression. It is a workhorse. You can use it for almost anything. It is a pad, and you are as likely to tear pages out and use them, as to work in the pad itself. Even if you are familiar with the media you choose, your results may be slightly different than with other papers. The paper is great for pen work. 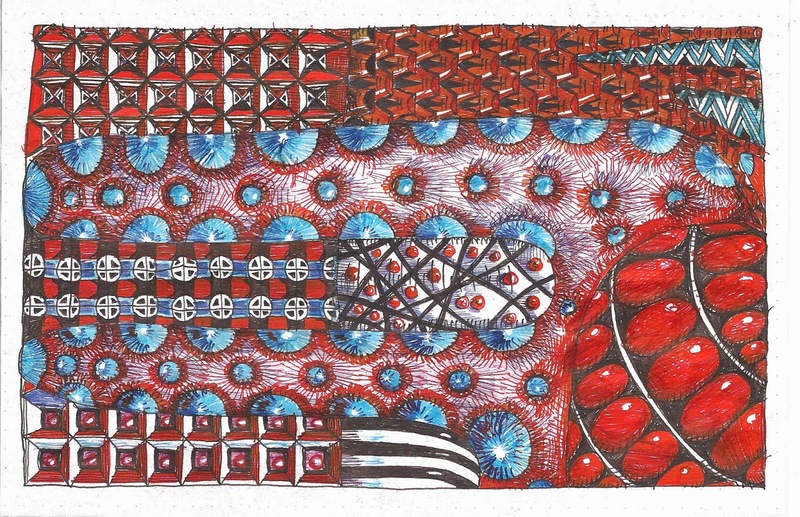 It’s fountain pen friendly, though dots will bleed through it you really saturate the paper. The dot grids are very helpful for learning and drawing patterns such as find with Zentangle or Celtic knots. Some watercolors may bleed through to the back of the page, but the paper holds it’s integrity well with little to no dimpling or curling. The GraF it would be fantastic for art journaling, quick sketches, or detailed artwork. And check up on all things journal related @ the Rhodia Drive blog and on their facebook page. 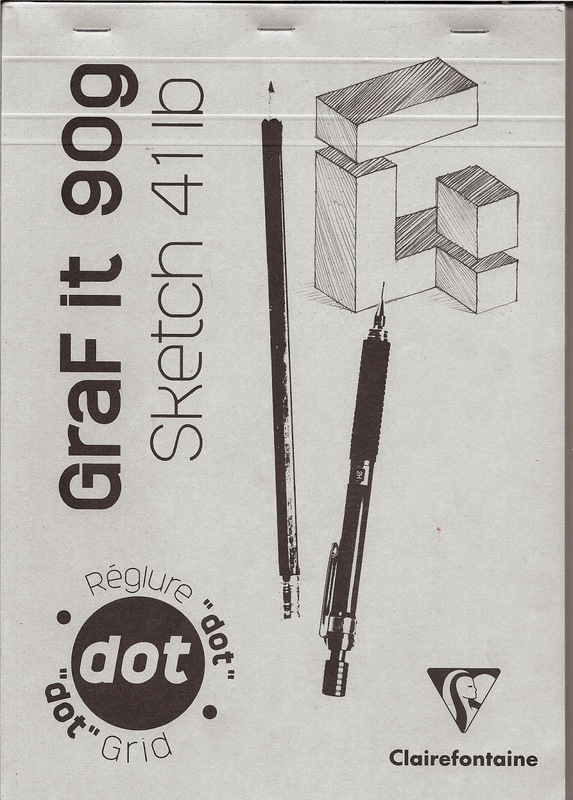 Disclaimer: I received the Clairefontaine GraF It dot grid pad from Exaclair Inc. specifically for this review and giveaway. I was allowed to choose the item to be given away. I’m excited about hosting this giveaway, but tried not to let it influence my opinion, and all opinions are my own. I received no other compensation. Thank you for letting me know your prize arrived. I hope you are enjoying yours as much as I've enjoyed mine!